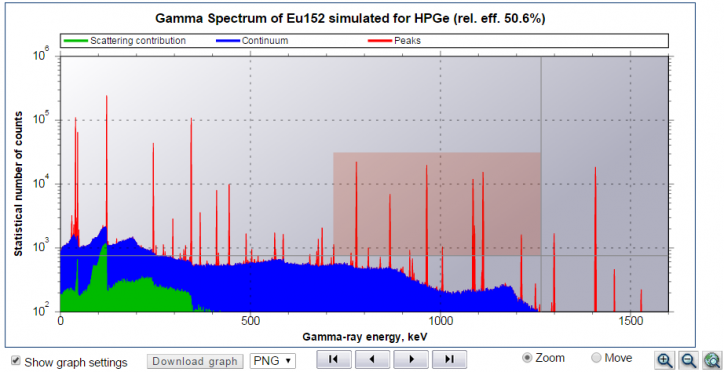 The Gamma Spectrum Generator is an interactive web-accessible application which can be used to simulate the gamma spectrum of radioactive substances. The simulator presents an efficient visual teaching aid that is especially useful in training facilities which have restrictions on the use of radioactive substances, or when sources of special interest (e.g. spent fuel, enriched U, weapon grade Pu or other highly radiotoxic materials) are not readily available. – all graphs have been upgraded. The data can be zoomed and scanned to a particular region of interest. Through the use of the cross-hair, the data for a particular curve or set of curves can be examined. – graphs can be downloaded in a number of standard formats. In addition the graph data can be downloaded in xml and csv formats for further processing. – for nuclide mixtures containing many components, a new paging feature allows the user to see details of all components nuclides. In the Dosimetry & Shielding application the download button for the data download has been extended. The user can now download all nuclide data to Excel or CSV files. This is particularly useful for nuclide mixtures where the D&S++ results can include many nuclides.